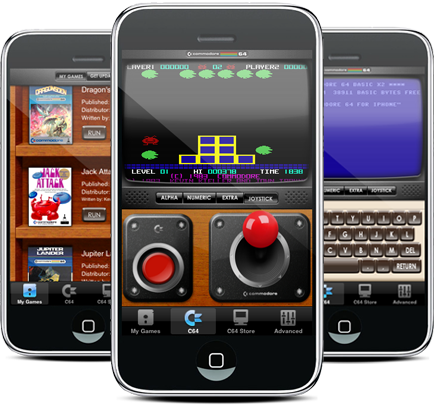 Manomio’s Commodore 64 emulator [$4.99] has finally been approved by Apple. We first reported on the project back in June, after Manomio had received their first rejection from Apple. The rejection was particularly disappointing considering the efforts that Manomio had made in making sure their emulator fully licensed and legal. We posted an extensive hands on with the emulator shortly after rejection. The final Apple approved version appears to be the same but with BASIC disabled. Note that some of the games demonstrated in the video aren’t actually available yet. See below for the launch list. It’s important to note that Manomio’s C64 emulator will not run arbitrary disk images, and only supports fully licensed disk images that are offered through Manomio. It works like this: the emulator comes bundled with several C64 games (Artic Shipwreck, Dragon’s Den, Jack Attack, Jupiter Lander and Lemans) along with standard Commodore BASIC 2.0 interpreter. Users can purchase separately sold program packs (early prices appear to be $0.99-$1.99 each and are determined by original IP holders) from the App Store that, when launched, install a game (or games) into the main application, adding them to the bookcase-like program launcher. The $4.99 C64 emulator costs $4.99 and includes 5 games: Dragons Den, Le Mans, Jupiter Lander, Arctic Shipwreck, and Jack Attack. Additional separately sold game packs will be coming soon. With the C64 emulator approved, Manomio is also clear to pursue further licensing deals and they have said they are actively working on adding new titles.